The fun part of a DIY project is that you can embellish as much or as little as you would like, making a totally unique piece that suits your own personal style. And if you’re looking for that perfect outdoor project to complete just in time for the summer, why not start with a mosaic table top for your backyard garden, patio, or deck? We’ll walk you through how to do it. 1. First, find an old table that you can refurbish. Consider looking at garage sales or thrift stores, or you might even already have a dated table that could benefit from a refresh. For the true DIYer, you can always build your table using stock lumber and wood screws. For more details about selecting your colors and even choosing your tiles, check out our how to design a mosaic from tile for the outdoors article. 2. Next, determine which tiles you want to use. To prevent having to size them down with a tile saw, make sure your tile will fit the width of your table, particularly if you opt to use tiles that come in sheets. If you prefer to make a bit more of a one-of-a-kind statement with your mosaic table top, purchase larger tiles, and then break them up using a hammer. Make sure that you smash only the underside of the tiles so as to prevent scratching the tile surfaces. Place the tiles to the side. 3. Prime the table, then add a coat of outdoor paint to give it a fresh new look and allow to dry. In this way, you’ll have a clean, new looking surface from which to work from, and you’re ready to begin adding the mosaic. For more ideas as to what color to use (whether for the outdoor paint, the tiles, or even the grout), check out the color selector tool. 4. Now, sort through the tiles, and arrange them on the table top. Get creative with this step, such as by putting the same colors together, mixing them up in rows, or making a cool shape. It’s always important to lay out your design and do a dry run before adhering anything. 5. Use a thin set mortar to apply the tiles to the table (dry powdered or premixed). Work in small sections at a time from the outside moving inward to prevent the mortar from drying before having laid the tile, and be sure to apply pressure on the tile for a few seconds after having placed it to ensure it has firmly adhered. 6. 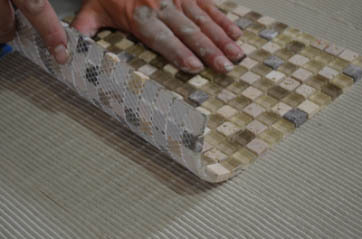 Allow the mortar to dry (usually for a few hours at least), then apply grout over the tiles and spread using a float. 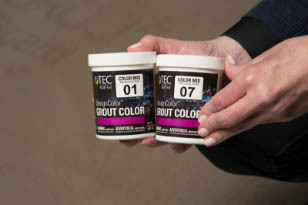 Use a grout that was intended for outdoors (like the TEC® Skill Set™DesignColor™Grout mixed with Grout Boost ,and make sure to be generous—you don’t want to leave any crevices unattended. 7. Using a damp sponge, remove excess grout from the tile, then allow to dry overnight. Finally, seal the table (it’s not a bad idea to do two coats) as this protects the grout from dirt and weather effects. Allow to completely dry before using. You’re now ready to enjoy your new mosaic garden table. Think you’ve got what it takes? Get started now and share your final projects with us on your favorite social channel using the hashtag #TECMosaicProject! If you’re ready to take on another fun mosaic project, consider trying one of these 6 DIY ideas for an impressive mosaic-inspired backyard. You can also access other summer and backyard inspirations by visiting our Pinterest page. To find more articles like this one, subscribe to this blog.